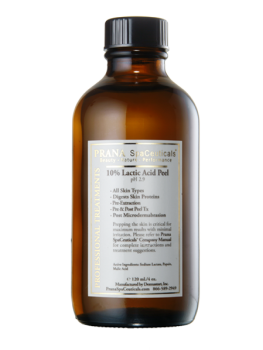 Prana 10% Lactic Acid Peel, 4 oz can be very effective for many skin conditions and types. This treatment is easy to tolerate due to its large molecular weight and hydrating, soothing ingredients. Lactic Acid Peel is a great introductory peel and can be used for general exfoliation, hyperpigmentation, smoothing, and stimulating all skin types. Malic Acid: An AHA (derived from apples) that exfoliates but also acts as an antioxidant. Tips: Add to NuCleanse to boost exfoliation. Use to degrease skin before other peels in place of Pure Solution for those sensitive or allergic to salicylic acid. Ingredients: Sodium Lactate (10% Lactic Acid), Aloe Cellulose, Pumpkin Extract, Papain, Malic Acid, Glycerin, Seaweed Extracts, Alpha Bisabolol (Chamomile), Honey.